Xiaomi unveiled the Redmi Pro today at an event held in China. The Redmi Pro is Xiaomi’s first smartphone that sports dual rear camera setup. However, this is not the only device that was unveiled by the Chinese company. 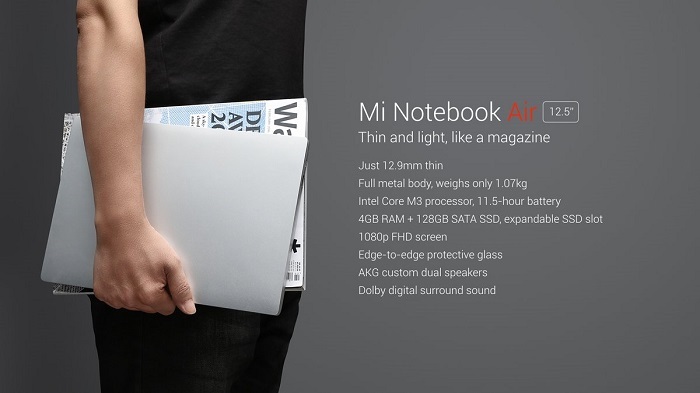 Xiaomi also unveiled its first laptop today – the Mi Notebook Air. 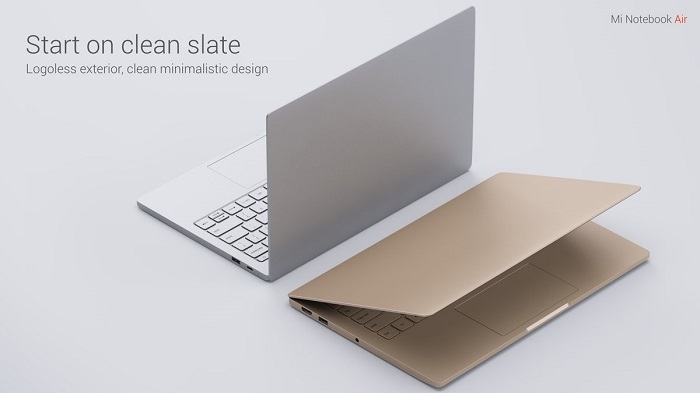 There are two models of Mi Notebook Air both of which run Windows 10 OS and flaunt full metal body. Out of the two models of Mi Notebook Air announced, one sports a 12.5-inch display whereas the other features a 13.3-inch display. Talking about the bigger model first, it is powered by Intel’s 6th generation Core i5 processor which is backed by 8 GB DDR4 RAM and NVIDIA GeForce 940MX graphics card with 1 GB DDR5 VRAM. The laptop comes with 256 GB PCIe SSD along with expandable SSD slot. Xiaomi claims that the battery provides 9.5 hours of backup and charges 50% in 30 minutes. Coming to the smaller model with 12.5-inch display, it’s a bit of a toned down version which has Intel’s Core M3 processor under the hood along with 4 GB LPDDR3 RAM. The graphics department is handled by Intel HD Graphics 515. It comes with 128 GB SATA SSD along with expandable SSD slot. As it has smaller display, it provides battery backup of 11.5 hours, 2 hours more than the 13.3-inch model. Both the models of Mi Notebook Air support Mi Cloud Sync which let you sync your phone contacts, messages, gallery, notes and other data. The Mi Notebook Air also unlocks automatically when the Mi Band 2 is near to it. 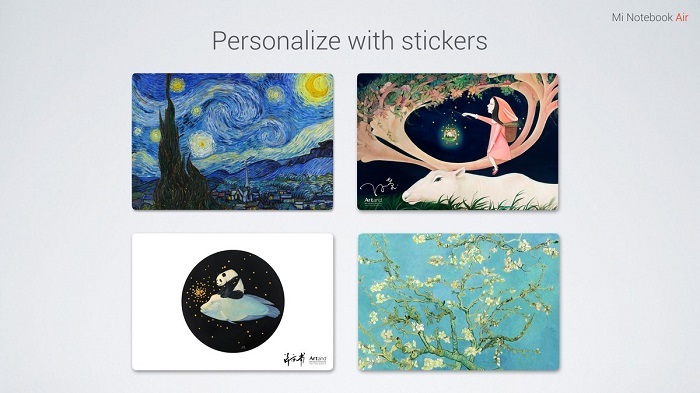 As you can see from the first image shown above, none of these laptops carry Mi branding at the front, hence, Xiaomi is providing stickers with which you can personalize the look of your Mi Notebook Air. Xiaomi will also be selling three different types of sleeves for the Mi Notebook Air – Leather sleeve, PU leather sleeve and Microfibre sleeve. The leather sleeve is priced at RMB 299 (around $45/₹3000) whereas the PU leather sleeve comes with a price tag of RMB 99 (around $15/₹1000) and the Microfibre sleeve will cost you RMB 69 (around $10/₹700). Talking about the price of the Mi Notebook Air, the 12.5-inch model will cost you RMB 3499 (around $525/₹35,000) whereas the 13.3-inch model will set you back for RMB 4999 (around $750/₹50,000). 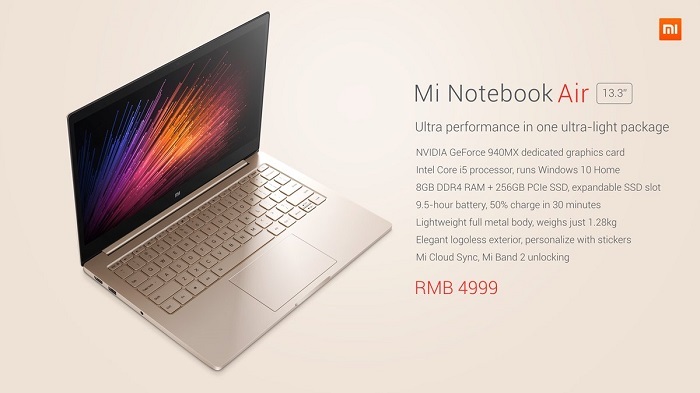 The Mi Notebook Air will go on sale from 2nd August in China and there’s no information about the availability of Mi Notebook Air outside the country.